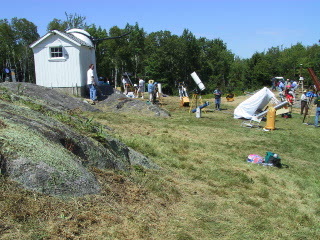 After having 3 miserable years of rainy weather, this year's 67th Stellafane Amateur Telescope Makers Convention finally brought weather that was normal for this event. A normal year means that Friday is rained out, Saturday during the day is fair and Saturday night clears up. This year was one of those years. Our core crew consisting of Lane, Dave, Jim and Mike made it up to Vermont early Friday morning. Al. T and Carol arrived midmorning after spending Thursday night at Donna's place in Chester. Scott E., Val, Michael, Bill H. Mike M. and Paul K. arrived throughout the day. Friday was spent relaxing as some of the members had stayed up all night before arriving. Most of the time we were lounging under the W.A.S. canopy. This year the group was camped on the sloped ground between the food tent and the Shupman telescope, known affectionately as the "bunker". If you have looked at its construction you will understand. Friday night was clear for a bit but was clouded out later. Fortunately we didn't have any rain. The evening talks were OK but most members left and retired early. Saturday was a sunny but hot, humid day. The lack of rain made the roads and trails dusty and everything was covered by a thin coating of dirt. Mike set up his scope and we observed the sun in hydrogen alpha for most of the day. 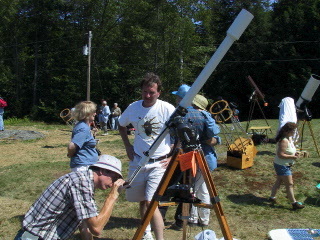 When we trekked up to the Hill, a few scopes were set up for judging. There appeared to be fewer scopes this year but every category was represented. 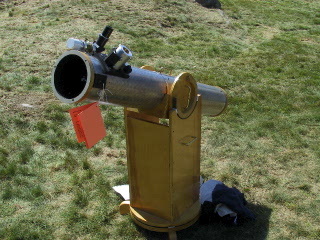 Dobsonians dominated the field but a few refractors, Newtonians and a classical cassagrain were in the mix. 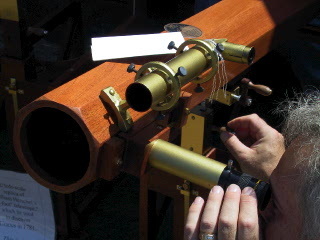 Some of the more unusual entries were the antique refractor reproductions, a brass astrolabe, a Springfield mounted scope, a solar refractor made of white PVC pipes and a scope made of coffee cans (appropriately named "Astrocan"). The evening brought the raffle and the announcement of the mechanical, design and optical winners. This year's main speaker was Carolyn Shoemaker whose talk started so late (10:00) that a lot of people left early. As the presentations proceeded, one could look up and see the sky turn dark and clear. It turned out to be a great night for observing. Some of our group stayed up until dawn. The next morning we packed up under clear skies and headed home. My friend Dave and I drove up to Springfield together as usual. We met our friend Jim at a rest stop on the NJ Turnpike about 2:00am and drove in the dark up the Garden State Parkway, the New York Throughway to Albany and across the Hudson through Bennington. We have favored this route over the years simply because it is an interesting drive and usually easy. About 3:00am, somewhere in the Catskills, I saw a very bright meteor through the windshield – it descended from the zenith toward the Northern horizon and ended in a flash. We also saw some clouds as we passed through this area but it remained clear through the rest of the drive. A while later, as morning twilight arose we saw fields covered by a thin layer of fog as we approached Albany. The early morning drive though Albany and across the Hudson river was easy and we began the long climb out of the Hudson river valley into the hills between Troy and Bennington. We stopped in Bennington for gas and breakfast and arrived at the Stellafane campsite about 8:30am and parked in line, waiting for the registration booth to open. I have made this drive with Dave and others 21 times, starting 1980 – I think I could do it with my eyes closed. By 9:20 we were setting up camp on the hill between the Concession tent and the McGregor observatory. As we set up camp, it became obvious that Vermont has not escaped the East Coast drought so the campground was very dry and dusty. As more campers arrived the dust increased, surrounding us with a dust cloud that coated everything, including tents, scopes and campers. It was so dry that I watched someone simply move their chair from one spot to another and they raised a cloud of dust! 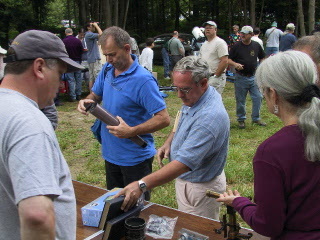 By Friday evening, the Willingboro Astronomical Society contingent consisted of Val and Michelle, Bill and Russell, Scott, Jim, Dave, Carol, Mike, Al, Mike, Paul, and Donna. The weather was clear until Friday afternoon when cumulus clouds arrived, followed later by cirrus. I attended the Friday night tent talks but started to doze off during an interesting talk on the astronomy of J.R.R. Tolken, having been up about 34 hours at that point. As I was walking back to my tent about 9:30pm there were some weak “sucker holes” in the cloud cover and some folks trying to do some observing but the only worthwhile object in the sky I saw was a minus eight Iridium flare. I crashed about 10:00pm and slept deeply until 7:00am Saturday morning, awakening to cloudy skies. Dave, Al and I went to the swap meet, met some friends and sorted through the items for sale. I didn’t find anything I wanted but Dave bought a book. Mid-morning the clouds started breaking up and by noon we had clear skies with a somewhat milky blue that became more transparent as the afternoon passed. By early evening, it was obvious we were going to have a very good night if the clouds stayed away. I brought my 5-inch Meade refractor and Mike brought his 4-inch Takahashi, 8-inch Takahashi, hydrogen-alpha filter and SBIG STV. I didn’t set my scope up on Friday because of all the dust in the air but we did some solar viewing with Mike’s equipment both Friday and Saturday. Our group attended the Saturday evening talks but I only stayed for the Lottery (didn’t win anything, of course) since it was a clear night. As soon as the lottery was finished I went back to my tent and set my scope up, leveled the tripod, initialized the computer and waited for dark. The first object I looked at was M17 and it was already showing good detail for late twilight. Also, the Milky Way was starting to shape up with the Sagittarius, Scutum and Cygnus clouds being obvious. 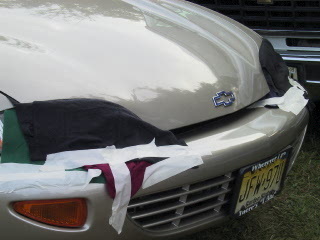 Meanwhile, Mike was setting up his STV next to me on his four inch. As it got darker, Dave, Paul, Mike and I looked at a series of common objects to assess the transparency – we judged it very good but not excellent. Meanwhile, the usual “mystery flashes” begin in the Southeast and continued for about 30 minutes. This seems to be a regular event at Stellafane in recent years. Sometime before midnight, Russel showed with his usual list of “challenge” objects – I always look forward to these and this year’s list was great. It contained not a single object I had viewed before. For the next several hours we stepped through each object, took turns looking, discussing what we saw and then verifying our visual observations with the Mike’s STV. Since both Mike’s scope and mine are computerized, this was a quick and easy process and proved effective. Every time I use an STV I become more impressed. It is a highly integrated, very well thought out, user-friendly machine. In addition to telescope observing, I also saw about a dozen Perseids and missed many more (I knew this, of course, because of the cries of others on the field). One left a trail that lasted about a minute. I also spent time just sitting in my chair simply looking at the sky. The outlines of the Milky Way were relatively sharp although I’ve seen it better in the past. The pipe nebula was obvious as was M31 but M33, which I’ve seen naked eye from Stellafane in the past, escaped my eyes. The night remained remarkably warm for Vermont – staying mostly in the sixties. I was comfortable in my T-shirt and shorts until midnight when I put on a long-sleeve shirt. Since Dave and I were driving home Sunday, I went to bed around 3:00am and it was still clear, transparent and warm! I woke up about 7:00am Sunday to a beautiful sky, warm sun and no wind. Finally, there was no rain! We broke camp to a hot sun Sunday morning and left about 9:30am. The drive home was uneventful except for the traffic jam on the NJ Turnpike at the “squeeze” near New Brunswick. Looking at objects through a telescope is is fun. I have been doing it for over 30 years and will never give it up. I have also built up strong star-hopping skills over the years and could point my scope, without looking at a star chart, at about 100 objects just from memory. When I bought my GoTo scope (a Meade 127ED) it was like being accelerated into the future and quickly decided I would never go back to star hopping. The prime reason is the increase in observing time but the GoTo also removes a lot of uncertainty from my observations. Watching Mike’s STV at work increased my understanding of the advantages of using CCD technology for observing (as opposed to imaging). The STV is a highly integrated machine that is remarkably flexible and easy to use in spite of its broad array of capabilities. I have felt for some time now that in “n” years (10 or more?) we will all be using some sort of electronic visual aids. This is a natural extension of our current use of computers both as databases and to control telescopes. Sometime in the near future I think we’ll see electronic oculars, similar to the one that Meade is marketing, that will enhance the visual experience enough at a low enough price that many observers will “buy” into using them. This will be a real departure from the current mainstream use of CCD’s for recording only. 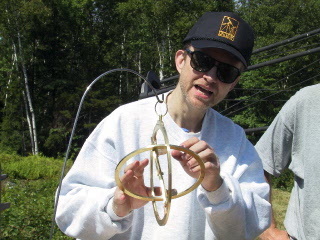 An example of where such a device would be useful would be in searching for M31 globulars. I also suspect we would use an optical system to view a small CCD and the whole package could look something similar to current large oculars. A “track and accumulate” function, such as found in the STV, would be very useful. Where it will go from there is anyone’s guess. I suppose the advent of these devices will fire up a debate from the traditionalists similar to the GoTo debates but the march of progress will continue anyway. I can’t wait. 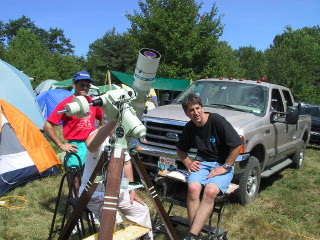 I’m not sure how many categories of star parties there are but one type is obvious – “observing” parties. The Winter Star Party, Texas Star Party and Black Forest Star Party are examples. In order to enhance the observing experience, they have tight rules and control over lights and traffic. While both allow vehicles on the observing field, you cannot move a vehicle after sundown (emergencies exempted, of course). There is also a “red light” only rule that helps. 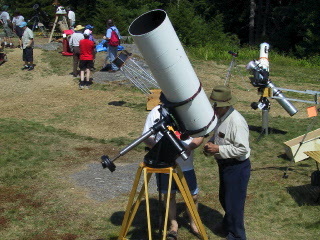 This approach allows observers to park and camp next to their scopes which is very desirable nowadays considering the extent of equipment most of us bring. “Visitors” must park in a separate area away from the observing/camping field so they can come and go without disturbing the observers and, more important, without putting the observers, scopes and children at risk from moving vehicles. 1. Use the entire area below the McGregor observing field down to the concession area as "day" parking. Anyone parking here can move their vehicle anytime of the day or night. 2. Don't allow any vehicle movement after dark in the rest of the campground except for emergencies. 3. Use the current parking area next to the RV/Trailer area as an observing field. Dave and Jim, waiting in line at the entrance. This year we decided to camp on the hill under the McGregor. It can be hot here and you are exposed to the weather but at least you can camp next to your scope. This car was serious about light control - even the headlights were blacked out. The swap meet was held Saturday morning as usual. Back to the grind. Us - from upper left, Paul, Dave, Mike, Jim, Mike, Al, Carol, Donna, Lane, Bill, Michelle, Val and Scott. Missing was Russel (he took the picture). Yes, it's still pink. A Breezy Hill flower. 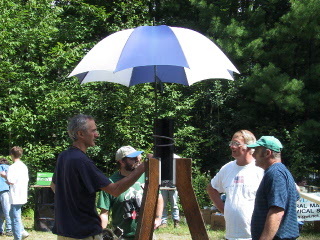 Hydrogen-Alpha solar viewing next to the big tent. As usual, a large crowd gathered for the Saturday evening talks. The demographics got a little boring but the prizes were great as usual. 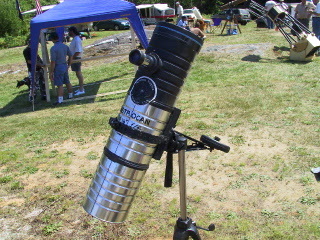 An antique reproduction f/14 reflector (Kelly John). 1st place for craftmanship. 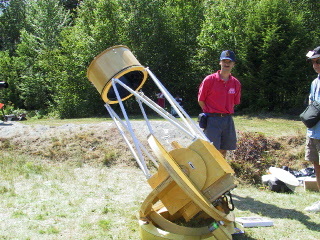 A simular scope discovered Uranus. Classical Cassagrain. 1st place optical and 3rd place mechanical design. Dave spots another book for his collection. David Levy and Carolynn Shoemaker. 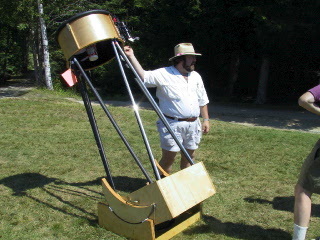 6 inch Dobsonian. Junior award winner. 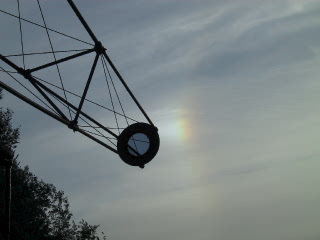 Dobsonian. Frank Bove, 2nd place for mechanical design. Split ring truss tube. Joe DeShane, 1st place mechanical design. 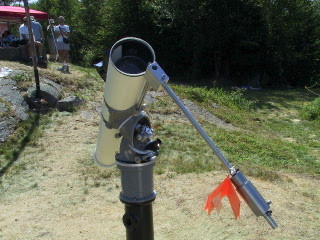 PVC solar scope. Special award winner. Springfield mount. Innovative design winner. 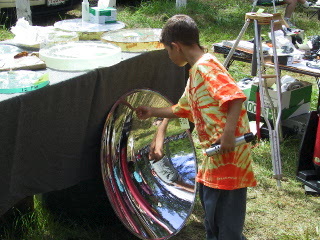 A large mirror provides an interesting kaleidoscope Mike and his 4" Takahashi. We observed the sun with a Coranado Hydrogen Alpha filter. 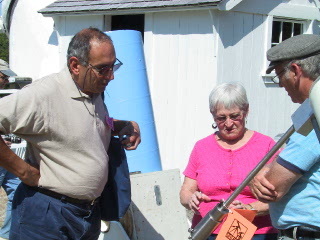 Breezy Hill - There were many different types of scopes being judged this year. A multiple use pier.